Global Tower Hamlets’ will be an afternoon of arts that will showcase the diversity and openness of the borough. 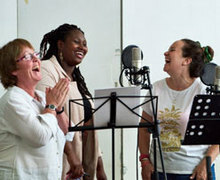 There will be a programme of performances from our community groups at Praxis (our youth group- Brighter Futures, our creative therapy group, our men’s support group-GIANTS, our women’s group- WINGs, our ESOLs classes and creative writing group) as well as from individual service users who would like to share their talents (e.g. traditional Indian dance, Colombian singing, etc). there will be a children’s crèche with kids activities throughout the event and a hot meal will be prepared by full trained service users. Everything at the event will be free. If these are your details and you would like to update them, click the button below to send an update link to the email address associated with this entry.